First impression: Surf's Up is a super-fast, super-fun read. This is GREAT because kids are going to be hooked from the first Bro-Dude-Whoa-Daddy-o!-Booyah!-Cowabunga! filled reading and ask for it again. And again. And again. Twenty-seventh, forty-seventh and fifty-third impressions: Seriously, y'all. We've had the book for like two weeks. It must be pretty good. 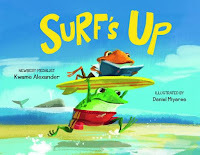 Have you read Surf's Up? What did you think? Each week I'll post quotes from 2 picture books - a new(er) picture book and a classic picture book. Be the first to identify a quote, and earn an entry into the current monthly giveaway! Identify both the book and the author for a quote, and you'll get two entries. Identify both for both quotes, get four entries. I'll review the Brand-Spankin'-New-Book on Tuesday! Want a shot every week? Sign up to follow me to be alerted to new posts! Check out Facebook and Twitter for clues. "Batten down the hatches!"... "Do what to the what?" "At last he became so angry that he pulled off his own cap, threw it on the ground, and began to walk away." When you have an exuberant threenager who is obsessed with flowers, you read a LOT of books about flowers, gardens and nature. 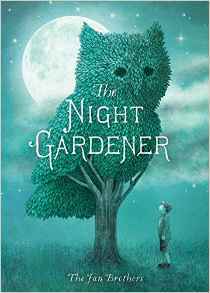 I am very excited about two of the newest books in our book collection, Bloom and The Night Gardener. 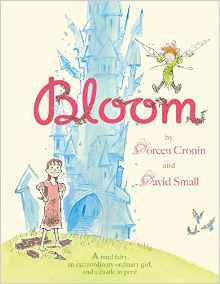 Bloom starts out as a fairytale-esque story about a fairy, Bloom, whose “magic” always managed to hold the kingdom together, but in messy, noisy ways. When Bloom leaves to find her own happiness, the kingdom falls into such disarray that the kingdom’s leaders are eventually prompted to search for Bloom. Bloom offers her magic to both the king and the queen when they find her – presented as a bucket of mud – but is rebuffed each time. Doreen Cronin and David Small have delivered a story that provides just the right balance of royalty, fairies and nature to keep both princess-obsessed and “tomboy” audiences entertained. While I would love to say that even boys would be entertained by the story of a fairy using the magic of nature and science to hold together a kingdom, there is a very female-centric message to the book. I would have loved to see the book explore the message that there is no such thing as an ordinary person as opposed to an ordinary girl. Despite that, Bloom is a beautiful reminder that even when we feel completely, or even less than, ordinary, we CAN do amazing, “magical” things. And speaking of amazing, “magical” things, the Fan Brothers’ The Night Gardener is another reminder that even small acts of art and creation can bring community together in magical ways. The brevity of the text (less than 400 words) allows the art to shine – and brings even more power to each beautifully chosen word. The Fan Brothers have delivered a story that feels like it has been around for many years – in the best way possible. Community, wonder, art and magic – all rolled up in one captivating package. I hope you enjoy both of these books as much as we have, but I would love to hear your thoughts! Each week I'll post quotes from 2 picture books - a new(er) picture book and a classic picture book. Be the first to identify a quote, and earn an entry into the current monthly giveaway! Identify both the book and the author for a quote, and you'll get two entries. Identify both for both quotes, get four entries. ""Show me magic that will save my kingdom," ordered the king. Bloom placed a bucket of mud at the king's feet." "...and Max said "I'LL EAT YOU UP!" so he was sent to bed without eating anything." ...And because I'm too excited to pick just two this week, today's post has an extra! "That night he went to sleep with a sense of excitement. The following morning, William was not disappointed." "Then after a while, and almost by accident, Henry picked up a half-eaten book from the floor. But instead of putting it in his mouth...Henry opened it up...and began to read. And it was SO good." ""Yes," said Mrs. Mallard, remembering the peanuts. "That looks like just the right place to hatch ducklings."" Did you know that Austin-area libraries, bookstores and children's entertainment/educational companies host over 100 story times PER WEEK? That's over 5000 STORY TIMES PER YEAR! While this list is up-to-date (as of the posting date) based on what is available online, please make sure to check in with the location before attending! Dates, times and locations can change! Please also note that while most of the libraries also have FANTASTIC programs for elementary aged kids, tweens and teens, this list focuses primarily on programs for the 5 and younger set (with some mixed age programs that go slightly older). Did I miss one? Let me know in the comments, and I'll add it to the list!